Wm. B. Eerdmans Publishing Co. has signed two leading New Testament scholars—Mark Goodacre, professor of New Testament and Christian Origins at Duke University; and Todd D. Still, Charles J. and Eleanor McLerran DeLancey Dean and William M. Hinson Professor of Christian Scriptures at Baylor University’s Truett Theological Seminary—to be the new coeditors of its prestigious New International Greek Testament Commentary (NIGTC) series. First published in 1978, the NIGTC series is widely recognized among New Testament scholars, pastors, and students as an authoritative resource for careful, accurate exegesis based on the original Greek text. Tens of thousands of volumes have been sold over the lifetime of the series. Howard Marshall, one of the former series editors, died in late 2015, and Donald Hagner, Marshall’s longtime series coeditor, will scale back his involvement in the series to concentrate on his own scholarship. Although Goodacre and Still are both now located stateside, they continue the trans-Atlantic heritage of the series; Still completed his doctorate at Glasgow under John Barclay after studying at Cambridge and St. Andrews, and Goodacre, English by birth, completed his education at Oxford and taught at Birmingham before crossing the Atlantic to teach at Duke. 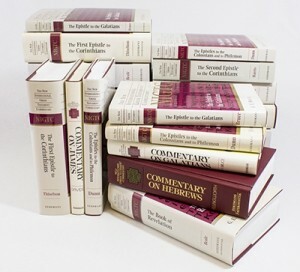 Still and Goodacre will work closely with Eerdmans New Testament editor Trevor Thompson and the entire Eerdmans editorial team to update the series guidelines, supply missing volumes, update or replace older volumes, and ensure that the NIGTC remains a vital resource for serious students of the New Testament. To learn more about the NIGTC series and browse available volumes, visit the series webpage.